For some, the term “data science” may sound rather academic—something only conducted in research labs to solve abstract problems that don’t matter to the average person. But while it’s true some data scientists spend their time solving theoretical physics problems, many are trying to find solutions to important real-world problems or to make everyday lives easier, combining a variety of analytical skills with data gathering tools and programming languages, whether it’s to make traffic run more smoothly or unlock the secrets of the universe. Ultimately, their efforts paint a picture in the form of data visualizations that illustrate how something works, a problem that needs to be solved, or better still, the solution. 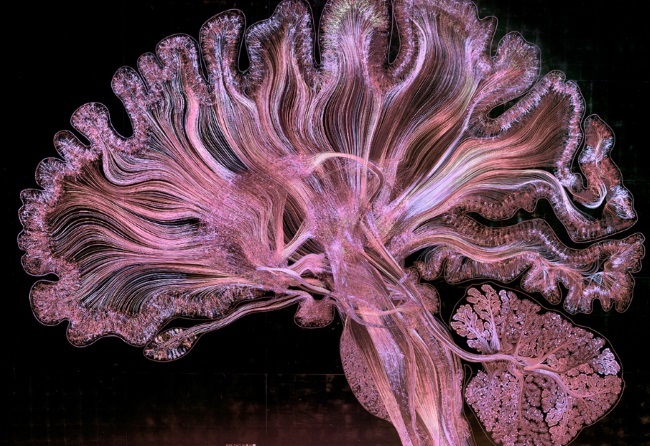 Much of the human brain remains to be fully understood, but artists Dr. Greg Dunn and Dr. Brian Edwards have successfully visualized what the human brain looks like with a visualization of itself. Dunn, an artist and neuroscientist, and Edwards, an artist and applied physicist, created Self Reflected to illustrate the nature of human consciousness. The “painting” is 25 etched plates layered together containing the circuit dynamics of around half a million individually created neurons and shows a slice of human brain at a magnification of about 22 times. There were more than 1,300 active satellites orbiting earth by the end of 2015, and they’re all in a database assembled by the Union of Concerned Scientists. Satellites are sized according to their launch mass and are coloured by their country. Ownership varies from commercial interests to government, with one company owning as many as 70 alone. Space is considered to begin at 100 km above the Earth, and of course, not all satellites orbit at the same height. 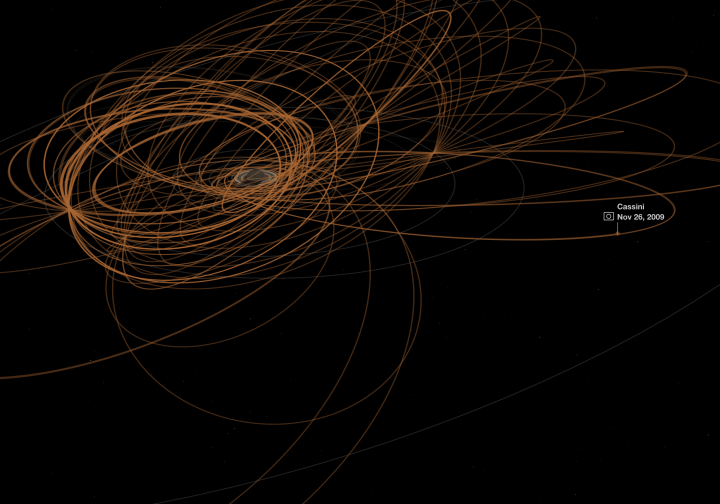 Some are in elliptical orbits that travel high above the planet down to lower altitudes and back. Creating models from massive amounts of information is easy for data scientists, but the challenge is figuring out how to present them to a non-technical person. 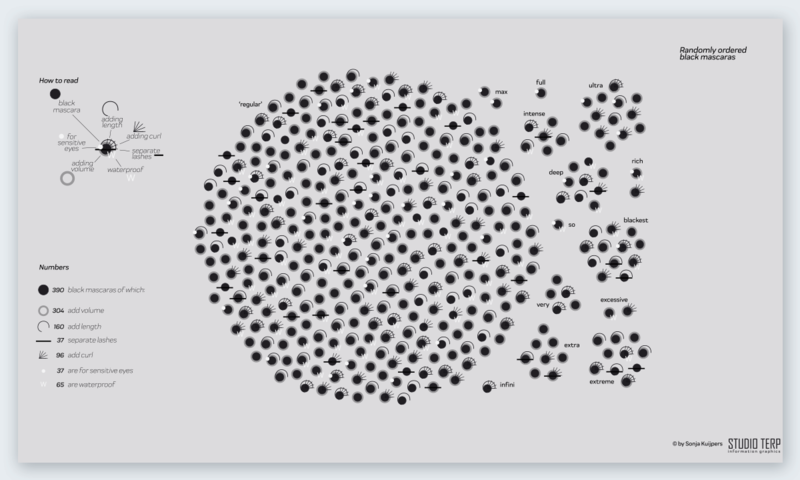 Not only does coding help create the models, but it can create visualizations to articulate them. Among the most popular programming languages are Python, R and Tableau. 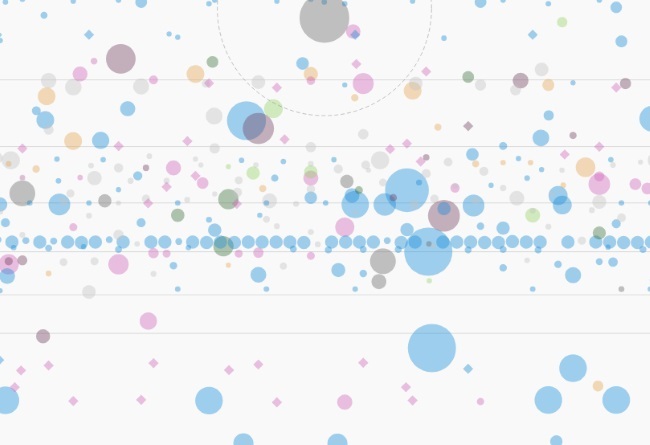 And what better medium than a visualization to tell the story of the Big Bang? 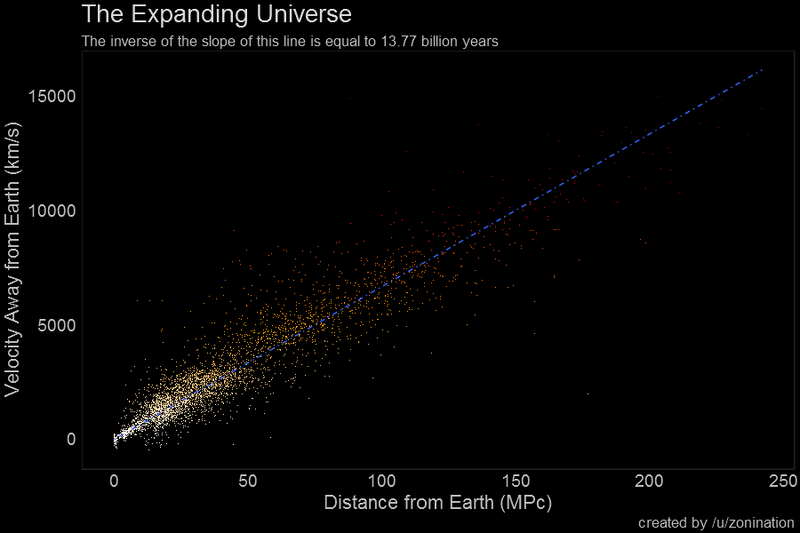 Using data from Hyperleda, a database for the physics of galaxies and R as the programming language, it’s possible to visualize the age of the universe. Mass shootings have dominated news headlines for the past few years, particularly in North America. And while some gun owners want to downplay gun violence, this data visualization paints the true picture. 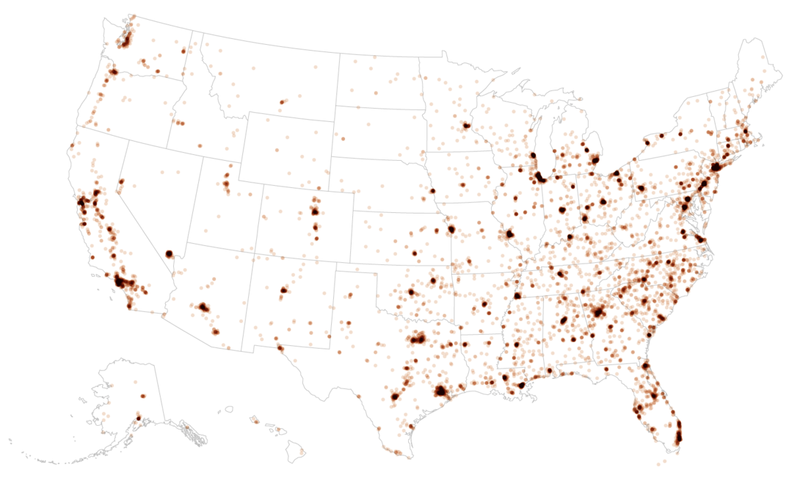 The Guardian did a geographic analysis that shows there were more than 13,000 gun-related homicides in the United States in 2015. What’s more striking is how the map shows gun violence wasn’t distributed evenly—rather, half of the homicides caused by guns were clustered around just 127 cities and towns, which contain less than a quarter of the nation’s population. Not all visualizations need to be formal and academic looking. An emerging form of visualization are data comics, which can be explained by—you guessed it—a comic. The stalwart art form has recently be used in combination with math to explain the concept of gerrymandering. “Changing the Math on Gerrymandering” by Olivia Walch visualizes what a proper Congressional district would look like through a series of comics and equations. If you’re a space junkie like me, you probably followed the voyage—and demise—of the Cassini satellite in orbit around Saturn. Nadia Drake and Brian T. Jacobs charted the satellite’s 13 years of travel for National Geographic. After a seven-year journey to get there, Cassini entered orbit in 2004 to explore not only the ringed planet but its many moons—one of the first things it did was drop the Huygens lander onto the moon of Titan. There’s more to the topic of immigration than building a wall, and data science is empowered to dispel myths about how many people are really crossing borders. 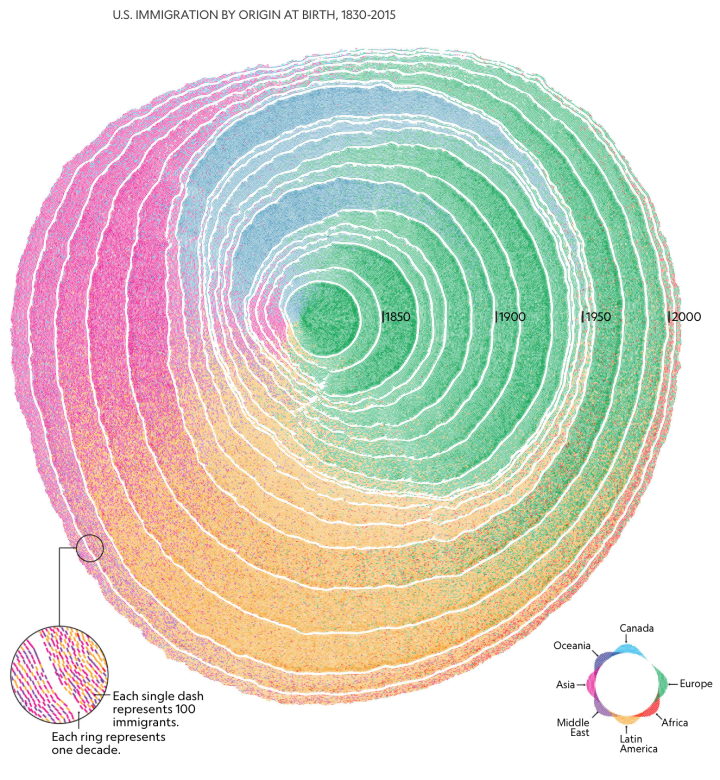 Data visualizers Pedro M. Cruz, John Wihbey, Avni Ghael and Felipe Shibuya of the Data Storytelling and Exploration Collaborative research team at CAMD Northeastern University depicted each era of U.S. immigration from 1830-2015 as a ring in a growing tree trunk based on data from Integrated Public Use Microdata Series (IPUMS). The neat thing about data science is it can apply to anything—even your favourite musician. For Adam McCann, it’s Bruce Springsteen, and he visualized every song recorded by The Boss using data from streaming music provider Spotify and other written sources to plot every single aspect of every song. Using a theme inspired by plants with seeds, leaves, and flowers, albums and songs are organized by popularity. For some people, what makeup they’re going to put on in the morning is a serious decision. For Studio Terp’s Sonja Kuijpers, the challenge was which mascara she should buy. She combined data from a Netherlands-based online makeup retailer with her artistic talent to visualize the colour of each mascara and its particular characteristics–lash separation, giving volume or length, and waterproof capabilities. #10 Would You Like To Play A Game? Not only can you explain a concept using visualization, you can turn it into a fun activity. 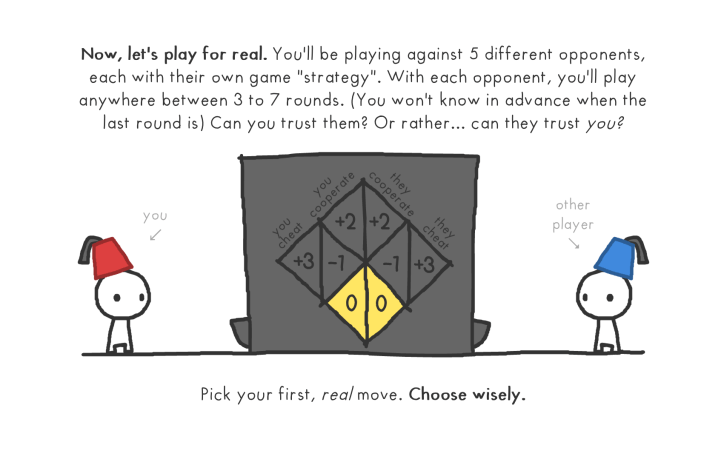 Nicky Case used game theory to turn a complex topic into an actual game—specifically, the evolution of trust between people and groups. She also uses comic art to illustrate how cheaters prosper in the short run but lose in the end, how the golden rule plays out, and the need for communication. Check out top-rated data science courses and training programs near you.